Now’s the time to grab longwave DX! If you’ve been wanting to log France Inter as longwave DX, you’re running out of time. France Inter is shutting down their 162 kHz longwave service on December 31, 2016. On the Radiodiscussions DX forum, Jim Farmer over in San Antonio got and recorded France Inter on 162 khz using a PK loop and Sony 7600GR. The PK Loop he’s referring to is this one and, of course, the Sony ICF-SW7600GR is one of my staple portables. While I’d love to try to grab France Inter with my Sony, my schedule makes it very difficult to arrange. 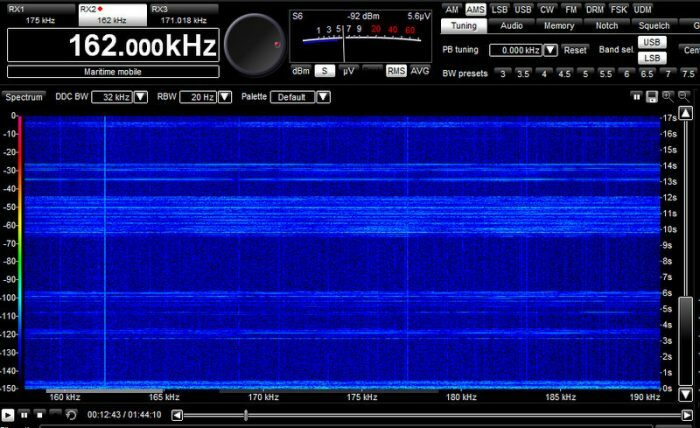 Fortunately, I have SDRs which allow me to record spectrum throughout the night, then review the recordings in the morning. Throughout the month of December, I’ve been recording a small chunk of longwave spectrum–with my WinRadio Excalibur–during the night and reviewing it in the morning in hopes that I could grab an opening from France Inter. I was rewarded on December 19, 2016 around 0300 UTC. Though there was atmospheric noise that night in the form of static crashes, I snagged France Inter on 162 kHz. My spectrum display from the Excalibur. 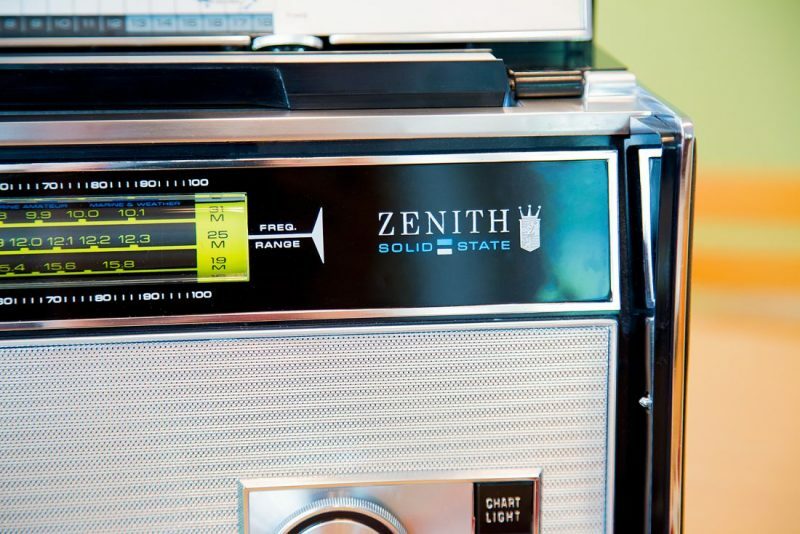 Mind you, both France Inter and Medi 1 only transmit at 2,000 watts–that’s flea power compared to our shortwave broadcasters. It’s amazing those signals can even hop the Atlantic. Actually, the power of France Inter and Medi1 is 2000 kW and 1600 kW respectively. So the power of most SW broadcasters should be called a “flea power” in comparison to what is used on longwave. The smallest output on LW band in Europe is 50 kW, it’s used by Denmark and Czech Rep. The 162 kHz transmitter is closing on Dec 26th, according to the latest news. Again, if you’d like to grab longwave stations before they disappear, now is the time! Our LW broadcasters are disappearing rapidly. Fortunately, winter (here in the northern hemisphere) is the best time to chase LW DX. Thanks, again, Ron for your encouragement! I’ll keep listening and recording! This entry was posted in Broadcasters, Longwave, News, Recordings and tagged France Inter, France Inter Cuts, Longwave, LW, Medi 1, Sony ICF-SW7600GR, WinRadio Excalibur on December 22, 2016 by Thomas. As many of you know, I’ve been catching up on correspondence recently as the past few weeks have been quite hectic. I came across your website recently, so good to read something dealing with proper SWLing! Last night I set up an experiment on 279Khz. 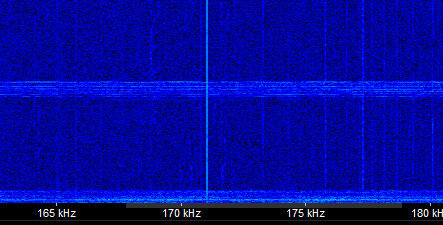 This is because of my interest in something called QRSS beacons in amateur radio. I use the HF bands, but recently became interested in the LF bands, 136 / 475Khz amateur bands and propagation. I thought it would be interesting to test for the times that the day / nightime occurs at LF. To do this I decided to use 279Khz, which by rights only has 2 transmitters on them, and at a convenient distance. The only list I have says that Belarus and Turkey operate transmitters, so in theory I should only see 2 traces on my Argo software. But I was surprised to see 3 traces. 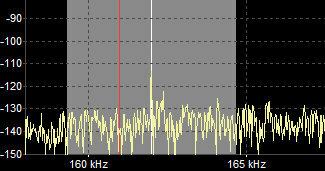 Two of them have about a 1Hz offset to the main one, exactly on 279Khz. I wonder if your readers can confirm the transmitters ? Maybe Belarus is operating two TX sites with the offset, and the other is Turkey ? 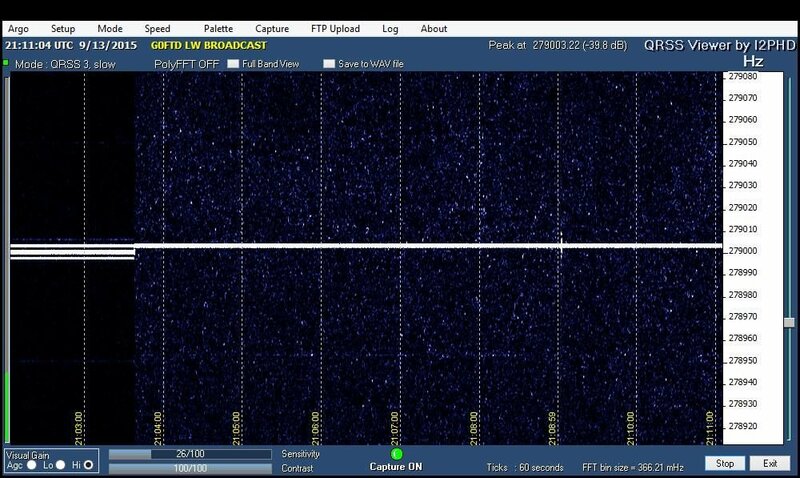 You can see that the two offset ones go QRT at the same time. If you can help Andy, please comment. Again, Andy, apologies for the delay in posting your inquiry! This entry was posted in Longwave, News and tagged Andy (G0FTD), Longwave, LW on October 15, 2015 by Thomas.